If I rasterize a vector, then make it a vector again, will quality be lost? In other words, is quality lost when transferring assets from Photoshop to Illustrator, and back and forth? A vector is a mathematical formula that is resolution independent. No matter what scale it is, it always has infinite quality. A raster, however, is resolution dependent and is made up of pixels and pixels aren't infinite. So by its very definition, a raster image is always less quality than a vector. Whether or not that is noticeable or not is a different matter. A good quality raster will look identical to a vector if the raster perfectly matches the pixel definition of the screen it's displayed on, but if it is resized or displayed on a screen with a higher pixel definition, it will have less quality than it's vector counterpart. If you try to make it a vector again (tracing), the vector will only match the raster pixels, therefore it will be less quality than the original. However, new algorithms are emerging that use predictive AI to make images higher quality when vectorising and resing as rasters. This means that you can make your image higher quality than it was when it was a raster, but probably not as good as it was when it was its original vector. Two artificial intelligence systems built by Google are able to transform a heavily pixellated, low quality, image into a clear photo or a person or object. Computer scientists from Google Brain, the central Google AI team, have shown it's not only possible to enhance a picture's resolution, they can fill in missing details in the process. 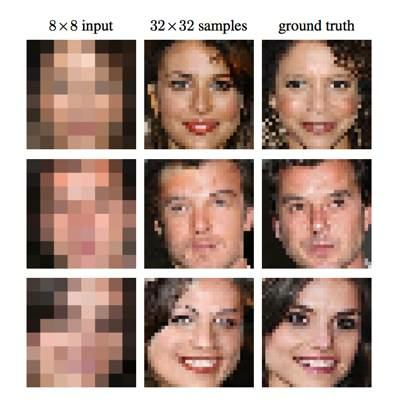 In a paper – Pixel Recursive Super Resolution – three researchers from the Silicon Valley firm trained their system on small 8x8 pixel images of celebrity faces and photos of bedrooms. Magenta is a research project exploring the role of machine learning in the process of creating art and music. Primarily this involves developing new deep learning and reinforcement learning algorithms for generating songs, images, drawings, and other materials. We’ve recently seen a number of interesting approaches to improving low-resolution images using machine learning, including ones from researchers at Google, and at the Max Planck Institute for Intelligent Systems. Now, you can try an AI-powered enhancing tool for yourself with just a couple of clicks. Yes, there will be quality loss generally. However, there is typically little need to double-convert artwork for use between AI and PS. Photoshop can place (linked or embed) Illustrator vectors, as vector. Illustrator can place (linked or embeded) Photoshop raster, as raster. If you want to change the illustrator file back and forward i think the best solution is embed it was a smart object in Photoshop. That way, everytime you change it on Illustrator, the changes are apllied on Photoshop. Not the answer you're looking for? Browse other questions tagged adobe-photoshop adobe-illustrator vector raster or ask your own question. Will scaling down incrementally hurt quality? Vector image in a .pptx exported to PDF: how can I avoid quality loss? There and Back Again: What changed when importing a vector from Illustrator to Indesign? When will quality be lost when increasing design size % or size wise?